Taking up cycling can be one of the best decisions you’ll make in life. Whether you choose to hop on a bike for health reasons, to help the environment, try a new activity, or even to supplement another sport, cycling is a ton of fun and adventures. Even a short commute of around 5 miles to work each day can quickly add up to more than 100 gallons of gas over a year, and correspondingly contribute to carbon dioxide emissions and global climate change. Biking to work doesn’t require fossil fuels and can help to reduce your personal contribution to climate change. There are many types of bike available in the market today which satisfy your passion and have economical as well as health benefits. Walking and cycling are gaining popularity in order to maintain good physical fitness and promote health. 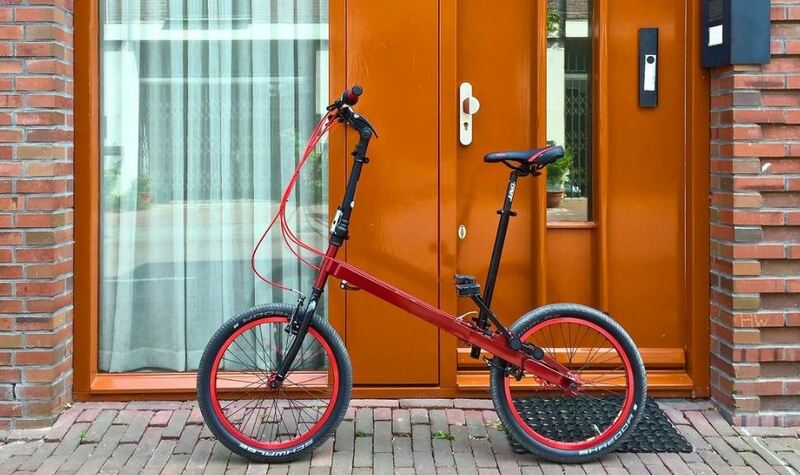 This trigged the creators’ of StepTwin bike, imagination to create a product that would combine both walking and biking. 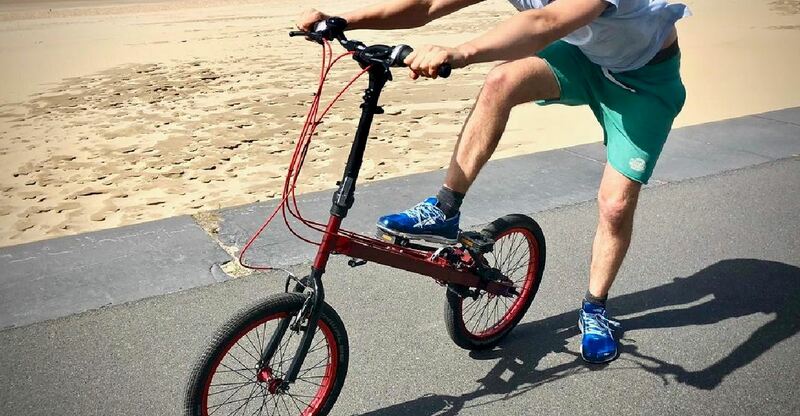 The StepTwin compact bike is said to be the world’s first ‘bionic’ folding bike, a small folding bike with a unique method of propulsion that you stomp down on like a Stairmaster. 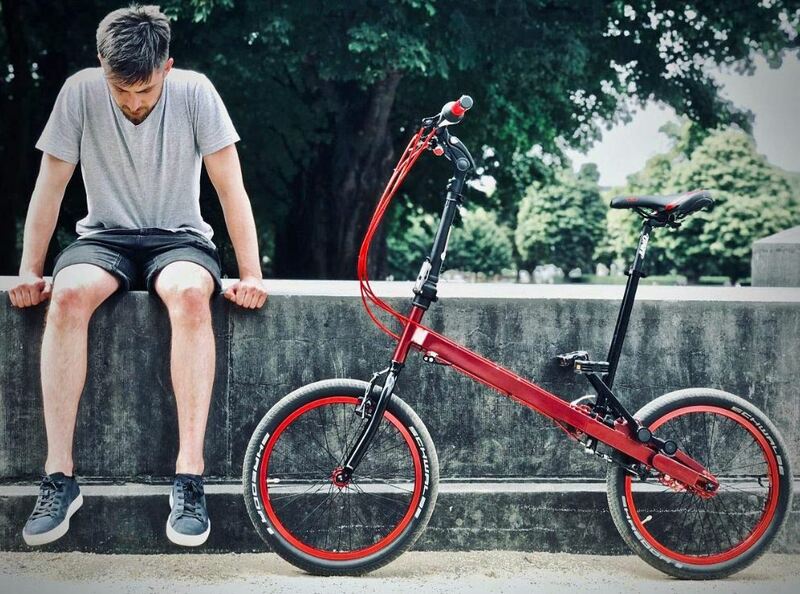 StepTwin bike has a sporty character and dynamic beauty, speed up 30 km/h or 18 mph, and incredible lightweight from 7.0 kg or 15.4 lbs. That makes you easy to handle and is suitable for all people, regardless of age or physical fitness. 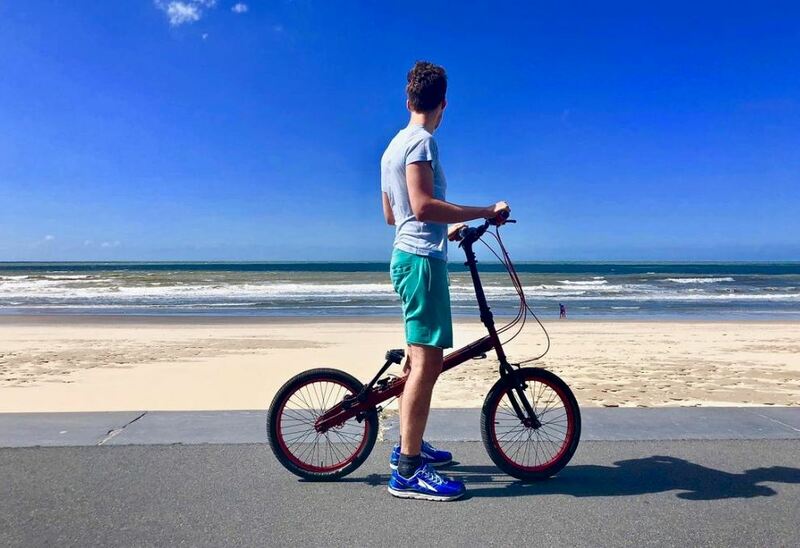 The bike is geared with two independent driving gears, wherein it employs Dual Bionic Independent Drive Technology that doesn’t overload the joints of the body. It makes riders sit, walk and ride at the same time! This makes it a practical means of transport fit for sports, leisure, commuting. The drive-trains exist on both sides, and you can pedal/stomp with any combination or right and/or left foot inputs, even at different cadences. It comes with 5 independent speeds for every leg, enabling for automatic and manual speed change. 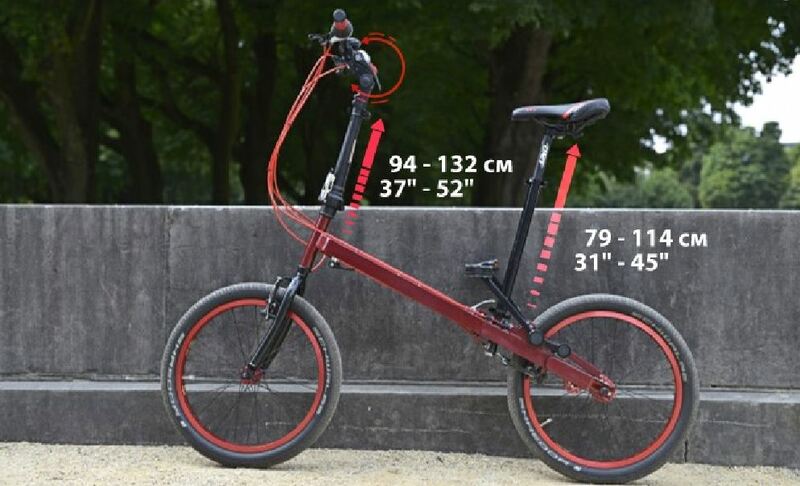 Using its folding technology, any rider can fold this bike simply in just a matter of seconds without the help of any special tools. It has an adjustable seat and steering column makes it perfect for any size, can accommodate riders from 130 cm to 210 cm comfortably, thanks to the telescoping design. The bike has no dead spots! The pedal can freely move far back and there is no need to apply force when pressing the pedal and there is no need to lift the pedal up, there is a return mechanism. All your power directing into the downward stroke, this is termed the "drive phase". You can end the drive phase with any leg at any time. You can relax any leg at any time. You can switch the speed separately for the left and for the right StepTwin drive with the help of two switches Shimano Revo-Shifter. Almost all of the forward energy of your legs turns into kinetic energy of the bike due to the innovative stepping drive. 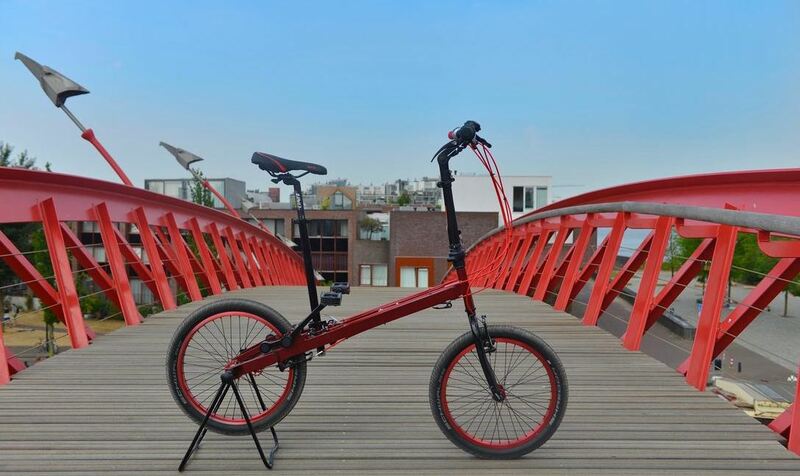 The StepTwin bike’s frame and rims are available in many colors, such as red, black, blue, gray, lime-green orange, and silver. 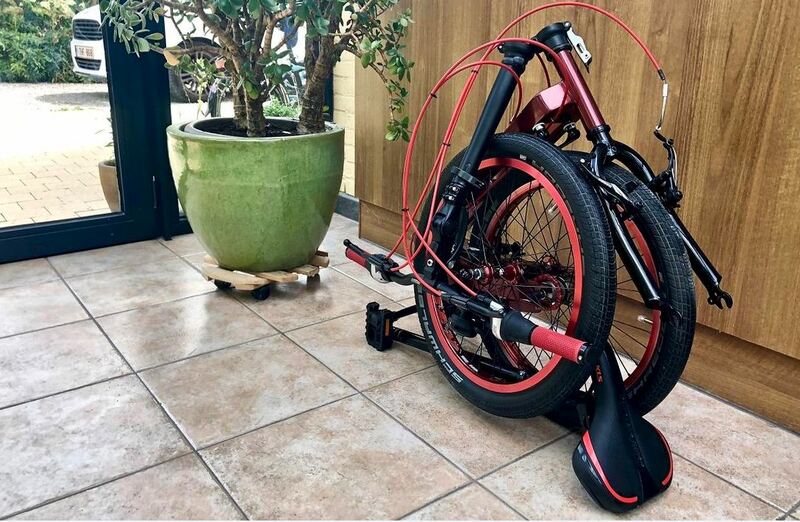 The StepTwin City Bike is designed to carry a maximum load of 110 kg, the equivalent of 242 lbs or 17 UK stone. 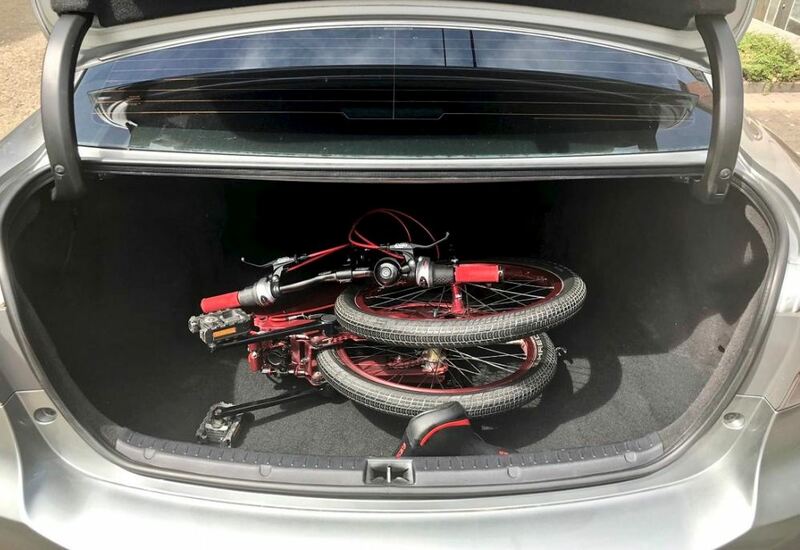 While the StepTwin Country Bike is designed to carry a maximum load of 120 kg, the equivalent of 264 lbs or 19 UK stone. 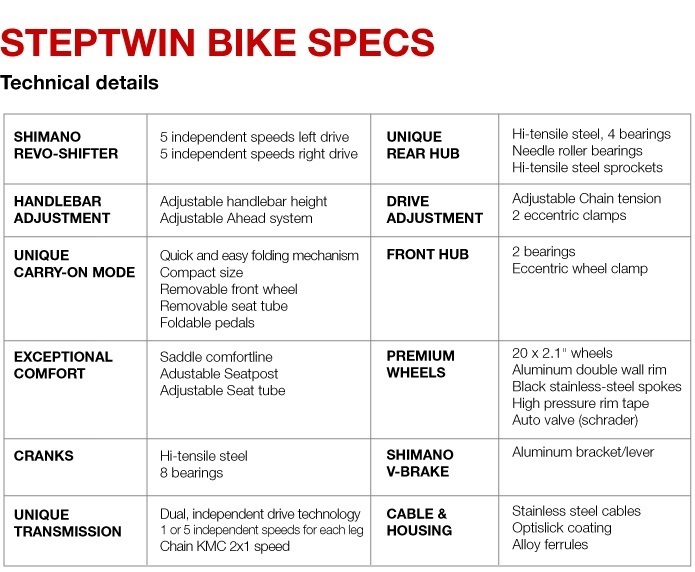 All StepTwin Bikes come with a 2-year international warranty. But wearable items such as brakes and tires are not covered by the warranty. Most local bike shops can repair these since the StepTwin Bike is based on many standard bike parts.